During a sneak peek into Lancome’s Christmas Wonderland, many of us beauty bloggers were instead distracted by Lancome L’Absolu Velours. I was obviously no better. 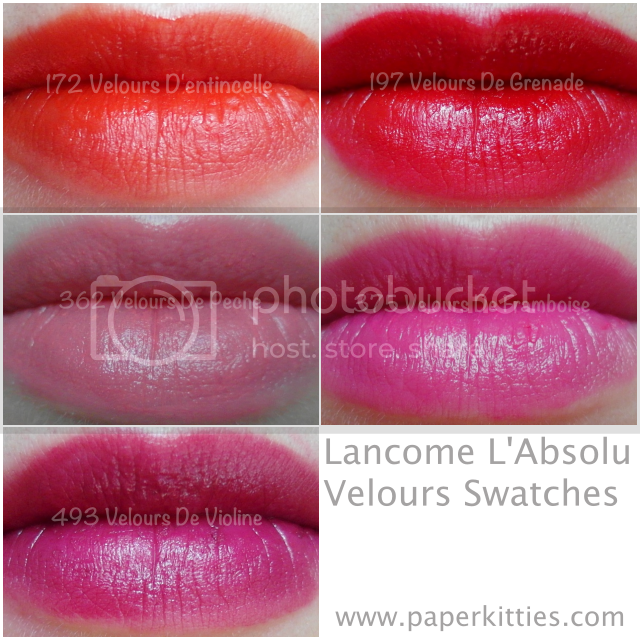 Highly saturated with a demi-matte finish, Lancome L’Absolu Velours goes on smoothly and has good staying power too. It’s comfortable and easy to apply thanks to the doe foot applicator, and I like how the colours are more intense and opaque as compared to Lancome L’Absolu Rouge Definition Lipsticks – despite being a “gloss”. To be frank, I find Lancome L’Absolu Velours pretty unforgiving on dry patches on your lips so it is very important to always exfoliate and apply lip balm before applying it. Best is if you do a lip mask the night before for a plump hydrated lip to better accentuate the colours and texture. If you’re into the 60s-inspired makeup like I am, you will definitely love shade #362, like a lot of my gfs are! It is a gorgeous pastel coral shade that looks very soft and velvety when you sheer them out by patting your lips with your fingertips. This lipgloss feels like a gloss, but turns matte when dried.. so refrain from touching your lips until it’s dried for longer lasting lip colour. It fades back to a stain eventually, so you don’t have to worry about looking weird. I do reckon I have found my all time favourite lip gloss, since achieving my dream barbie lip colour is now possible.